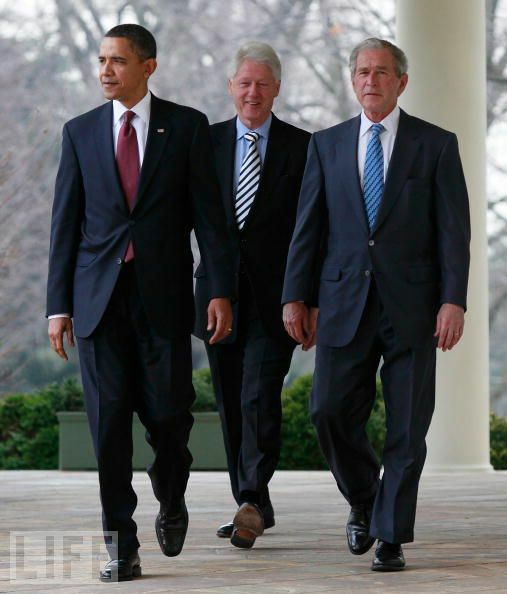 George W. Bush X 2 = Barack Obama in both extra spending — and tax cuts. It’s a crude but fair summary of the two presidents based on new data mapping how the nation moved from surpluses in 2001 to record deficits over the past decade. And it takes on special meaning given the turmoil these days in the Senate, whether in producing a budget, salvaging months of work by the bipartisan Gang of Six or expanding the Treasury’s borrowing authority to avert default. For Republicans, the new numbers — compiled by the Congressional Budget Office — bolster the GOP’s argument that President Barack Obama has gone well past Bush’s hearty appetite for new spending. But for Democrats, the same equation underscores the fact that the growth in discretionary appropriations since 2001 has been matched almost dollar for dollar by a series of tax cuts that were also expanded under Obama. Indeed, from 2002 through 2011, CBO estimates that the combined tax cuts enacted by successive Congresses cost $2.8 trillion, even as increased appropriations added $2.95 trillion above projections for discretionary spending. Breaking down these numbers for the eight years under Bush, the annual average was almost identical: Tax cuts cost an extra $230 billion a year, as did appropriations. From 2009 through 2011, under Obama, extra spending ramped up to $495 billion, but tax cuts — measured against CBO’s 2001 baseline — also jumped to about $430 billion per year on average. Democrats wince at Obama’s record here, and with Treasury having hit the federal debt ceiling this week, they want new revenues to be part of any bargain that will surely cut from their spending priorities. Republican leaders are insisting on no new revenues and appear content to have a shorter extension of Treasury’s borrowing authority if it gives them a second bite at Obama’s domestic appropriations — as well as limited savings from government benefit programs and retirement payments to federal workers. This is a risky strategy because it ensures a second debt vote for House members before they run in 2012. But the politics are such that this may be inevitable in any case, and Republicans want to avoid a repeat of the government shutdown fight that already consumed so much of this year. This explains why Senate Minority Leader Mitch McConnell (R-Ky.) was so insistent at the White House last week that before any debt ceiling vote, he wants annual caps on appropriations decided for fiscal 2012, beginning Oct. 1, as well as 2013. At the same time, McConnell signaled that any grand bargain — when revenues and tax reform might come back into play — would be pushed back past the immediate August deadline. “My greatest fear is a minimalist deal,” Senate Budget Committee Chairman Kent Conrad (D-N.D.) told POLITICO, and rather than proceed with a markup before Memorial Day, he announced Thursday that he will wait to see what the White House talks led by Vice President Joe Biden produce. After a morning caucus, committee Democrats insisted they aren’t just stalling. “We’ll have a Democratic budget. I’m confident of that,” said Maryland Sen. Ben Cardin. Conrad argued that by waiting, he leaves open the option of using the budget resolution as a vehicle to help implement whatever agreement emerges from the Biden talks. This was the pattern, in fact, for the major deficit-reduction agreements in the 1990s, but the delay in this case also serves to buy time to salvage months of work by the Gang of Six, of which Conrad is a member. This bipartisan group has flirted for weeks with a final agreement on an ambitious deficit-reduction plan akin to the presidential debt commission’s report last December, tapping both revenues and spending cuts. As such, it posed a threat to leaders like McConnell, who had to be quietly delighted this week when Sen. Tom Coburn (R-Okla.) suddenly opted out of the group, isolating the two remaining Republicans, Sens. Saxby Chambliss of Georgia and Mike Crapo of Idaho. Putting on brave faces, the survivors continue to meet. “We’re five guys who have been meeting, talking, deliberating for five months, and it’s hard just to, bam, cut it off,” Chambliss told POLITICO, but he allowed that “maybe nothing” will come of the effort and said he had no appetite for the group now issuing a report on the progress made. “We’re not going to issue a report of any sort,” Chambliss said. In fact, such a report would only add to the risks he and Crapo have already incurred by taking a stand on revenues being part of the deficit mix. And Chambliss said Coburn has been so “integral” to the effort that getting him back in the fold is his first priority. Absent that, one option under consideration, according to three senators, would be to expand the group substantially by inviting in concentric circles of additional Republicans and Democrats who have watched from the outside but have expressed support for the group’s work. No decisions have been made, the senators said, but this could jump-start the effort in time for it to be a force this summer or fall — depending on the debt ceiling talks. The $6.2 trillion in accumulated deficits from 2002 through this year are certainly a big factor in the debt today — and in the needed debt ceiling increase. And CBO’s famous projection of surpluses during the same period has almost become part of Washington’s budget lore over the years. But the little noticed table—posted last week—is the most detailed, up-to-date snapshot of how the world changed, beginning with the economy itself. The largest single factor is a $3.4 trillion dropoff in projected revenues attributed by CBO to “economic and technical” changes. The year-by-year data reflect the economic downturn that Bush faced in his early years, and, under Obama, it accounts on average for about $680 billion annually. Apart from the tax cuts and discretionary spending, nearly $1.4 billion in so-called mandatory spending is a fourth factor. These costs include the Medicare prescription drug benefit begun under Bush, the 2008 financial-rescue package, as well as expanded benefits — such as food stamps and jobless benefits — that have been part of Obama’s economic recovery effort. Most striking, the added cost of paying interest on the resulting deficits is almost as large: $1.37 trillion.